Motherhood. Wow! Children add a new dimension to our lives. Our lives are full. We have unending to do lists. We multitask well. Adding meditation practices radically improves our ability to cope with and even thrive with all our responsibilities. Meditation has been a practice used for thousands of years for seekers of higher consciousness. For us, in this modern day, it is medicine for alleviating stress, managing emotions, decreasing anxiety and depression, and guiding us in good decision-making. It has physical, mental and emotional benefits. We were born as babies living in the present moment; you can witness this in your own children. Our culturization trained us to dwell in the past and worry about the future, and abandon the most important aspect of our essence – present moment consciousness. It is there that we find joy, freedom and peace. Meditation, as a practice, retrains our brain waves to restrengthen their connection with the present moment. When we have this experience, even briefly, we feel alive and clear. A few months ago a groundbreaking study was published in Biological Psychiatry. The research used the western model of scientific thoroughness to study mindfulness meditation. The amazing results showed that meditation could change the brains of ordinary people and potentially improve their health. There are numerous health benefits well-researched and documented about meditation and mindfulness. The benefits of meditation can touch many areas of your life, while becoming more present and attentive with your children. Meditation can be done anywhere, anytime and is free! Simply put, it is a vehicle toward a better life. Walking meditation is a form of meditation in action. For some people, it is easier to be more aware of their bodies while doing walking meditation as opposed to sitting meditation. It is a simple tool to help us appreciate our experience. It can make walking a more intense experience as well as very enjoyable. It is easy to practice, and enhances physical, mental, emotional and spiritual well-being. It is a misconception that the only way to meditate is by sitting, since what is most important is what is happening internally, and not how you look from the outside. Therefore it doesn’t matter if you are in a pretty “lotus position” or not. We have all seen the yoga models on the front of magazines assuming this classic position. We often have felt that if we don’t have the perfect meditation cushion or beautiful candle or peaceful area to meditate in then we are not doing it right or achieving the goal. We also have heard from someone that they, “just can’t sit still” to meditate, or they just can’t fit it into their day. Walking meditation is a great way to incorporate meditation into our ordinary lives, because you can do it anytime you are walking! This includes normal circumstances like walking from your office to your car. It is also a misconception that walking meditation is a more novice form of meditation. In walking meditation you are using physical, mental and emotional experience of walking as a basis of developing greater awareness. Of course there are differences between walking meditation and sitting meditation. Especially since you have to keep your eyes open so you wont trip or bump into something or someone! Therefore, you don’t withdraw your attention from the outside world in the same way that you might do with sitting meditation at home. There are no right or wrongs with where or how long you are going to do it. But my suggestions would be to try to find a route with less traffic, like a quiet neighborhood or park. If you have the option, by water or the woods are ideal. I would also try to carve out at least 20 minutes if possible. As a mother, you are often so busy taking care of everyone else that you often put yourself last on the list. Since your family relies so heavily on you, it is important to remember to take care of yourself. A survey from the American Psychological Association shows that women are more likely than men to experience physical and emotional symptoms of stress. Children are sensitive to their mother’s stress, and reportedly have higher levels of stress themselves when their moms are overworked, anxious or depressed. It is well documented that stress has numerous negative health consequences. It is ideal for busy moms to have several tools they can access to help alleviate stress and its unhealthy consequences. Healthy eating and sleeping habits are of course on the top of the list. But just as important are ways to add more joy, fun, and conscious awareness. Ever since my children have been little, one of my favorite things to do when I have a small amount of “free time” is to go for a walk. When my children were younger, if they were napping and/or I had another person in the home to watch them, I would often choose to get out of the house and just walk. My intent was to clear my mind as well as get some exercise so that after I returned I was more equipped to handle the rest of the day. But what I often found instead was that as I attacked that walk with fervor, my racing mind would ruminate about my current stresses and problems. I would ruminate about how mad I was at my husband, or beat myself up about how I overreacted to my child’s behaviors, or worry about money, etc. You get the drift. When I returned to the house, I wasn’t in a better place. In fact, I was in the same mood, if not worse, from when I left. I could feel frustrated that I didn’t feel any better, and I just “fed fuel to the fire” of my stresses. Over time I finally admitted to myself that this wasn’t healthy for anyone involved. For many years now I have been on a wonderful journey of exploring, incorporating and discovering holistic health and mind-body healing. Being a health care provider myself, it has greatly enriched my work with my patients, as well as for my family and myself. Throughout the years I have developed a walking meditation that never fails to give me a small amount of much needed tranquility and clarity. I call it my “two for one” because you get exercise and mindfulness all at the same time. In fact it is even more than that because you also get the much-needed time outside in nature as well as time alone with yourself. It has spiritual and physical benefits. It is fairly quick and it is simple. You can spend 15 minutes or you can spend an hour or 2. This meditation has come to me intuitively, and was greatly influenced by my studies of meditation over the last several years and its profound effects. When I first set out I allow myself to have my thoughts for several minutes, or however long it takes. 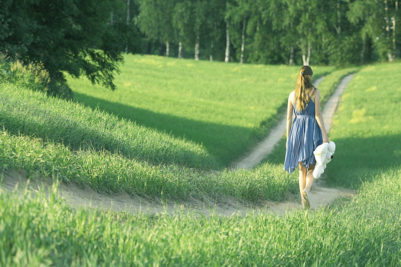 As I am walking I imagine these thoughts or circumstances blow off my back behind me, while I am leaving them behind as I continue to go forward. When I am feeling ready I will begin consciously and deliberately going through each of these concepts one at a time: Seeing, Hearing, Smelling, Feeling and Experiencing. As I am mindful of one sense, I block out the others, so that I can fully be present with each individual one, one at a time. Seeing– close off all your other senses and look around and really take in your environment through your eyes. Look at the color of the sky, the shape of the clouds. Look at the buildings, or the trees and landscape. Look at the people or animals or cars that you pass. Look at the road or the grass or the land that you are walking on. Whatever is in your environment, look at it, without judgement, analysis or decision-making. Simply look. Hearing– just listen to whatever it is that you hear. It could be the wind or the rustling of the trees. It could be the honking of the cars, bells on a church, or the noise of traffic going by. It could be people talking, or the noise of construction. It might be the sound of your footsteps on the chosen terrain. Just listen, without judgement, analysis or decision-making. Smelling– smell the earthy smells or the city smells. The smell of hot steamy pavement, or the smells of the crisp cool air. The smell of what is cooking in the house that you are walking by, or the smell of the pavement being poured at the construction sight. The smell of the ocean, or the garbage from the garbage bins. Just smell the surroundings, no judgement, just smell. Feeling physically– feel the temperature on your skin. Feel the sun, or lack thereof. The humidity or the dryness. Feel the precipitation. Feel the wind against you as you walk forward. Just feel, no judgments. Feeling emotionally– allow yourself to feel your emotional state. Do you feel hurried or worried? Do you feel content or happy? Do you feel neutral? Are you in awe by the natural beauty around you? Do you long for more green space and natural surroundings? Do you feel inspired to incorporate more mindfulness into your life? Or do you feel this is a silly and nonsensical exercise? Allow yourself to recognize your emotions without judgement or trying to change them. Experience– now allow yourself to experience everything all at once, what you see, hear, smell and feel. Relish that your body allows you to have such a complex sensory system and that you can experience so many things at the same time. If your mind drifts off and starts thinking of other things while you are doing this exercise, just gently remind yourself to redirect back into your intention of the walking meditation, which is to fully experience the present moment. Some days might be more difficult than others. If you feel particularly anxious or overwhelmed that day, you may find yourself redirecting your attention back several times over and over. That is absolutely fine as well. If you cannot leave your home, or if the weather does not permit it, you can still do this while sitting on your couch, your porch or even walking inside your home or in your own backyard. And guess what, if you are not a mom, you can still do this too of course! Many mothers find that fitting meditation into their day more than makes up for the time it takes. The divine and feminine qualities- intuition, patience, wisdom, love—often depend on how rested and free of stress we are, and how aligned we are with what nourishes us. After this small amount of time that you gifted yourself with, you can become clearer, more mindful, more grateful, and therefore a better mother. The benefits are numerous and bountiful. Happy walking! Lara O’Neil APRN is a Certified Pediatric Nurse Practitioner at ProNatural Physician’s Group, an integrative medical practice in Berlin, CT. She bridges traditional with integrative care from birth through age 21. She is an in network provider for insurance companies and is accepting new patients. Find out more at www.pronaturalphysicians.com or call 860-829-0707.